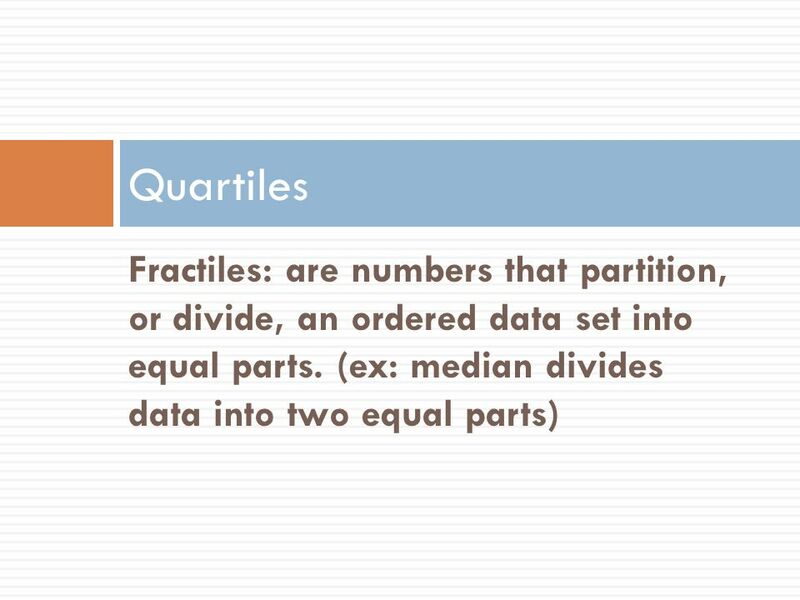 3 The Quartiles, Q1, Q2, and Q3 approximately divide an ordered data set into four equal parts. One quarter of the data fall below Q1. 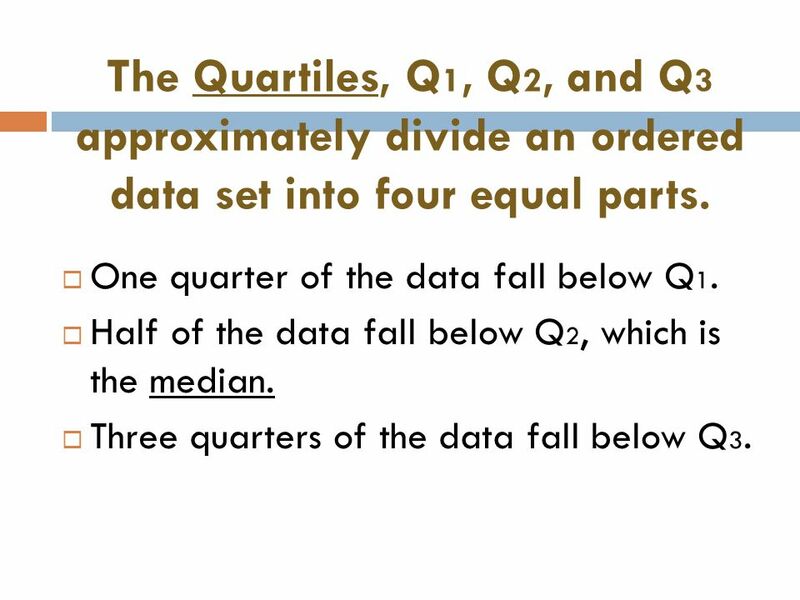 Half of the data fall below Q2, which is the median. Three quarters of the data fall below Q3. 4 Ex 1: The test scores of 15 employees enrolled in a CPR training course are listed. 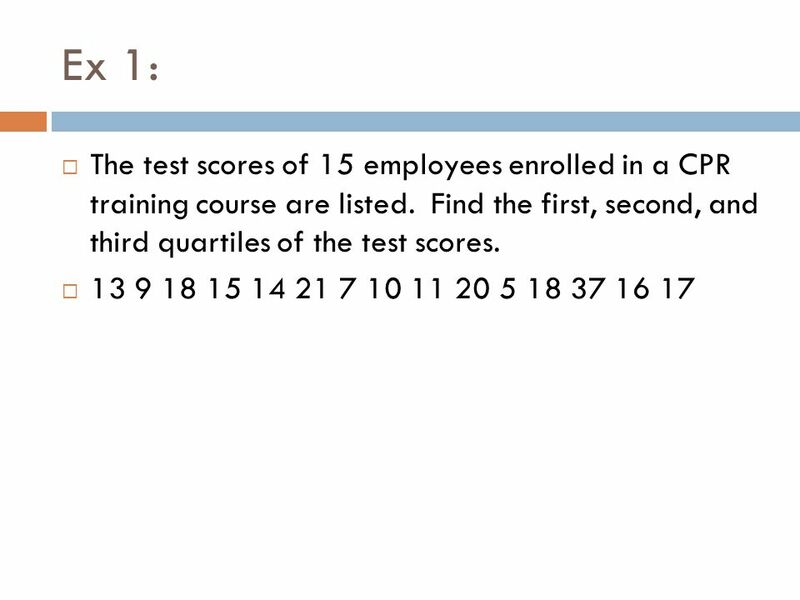 Find the first, second, and third quartiles of the test scores. 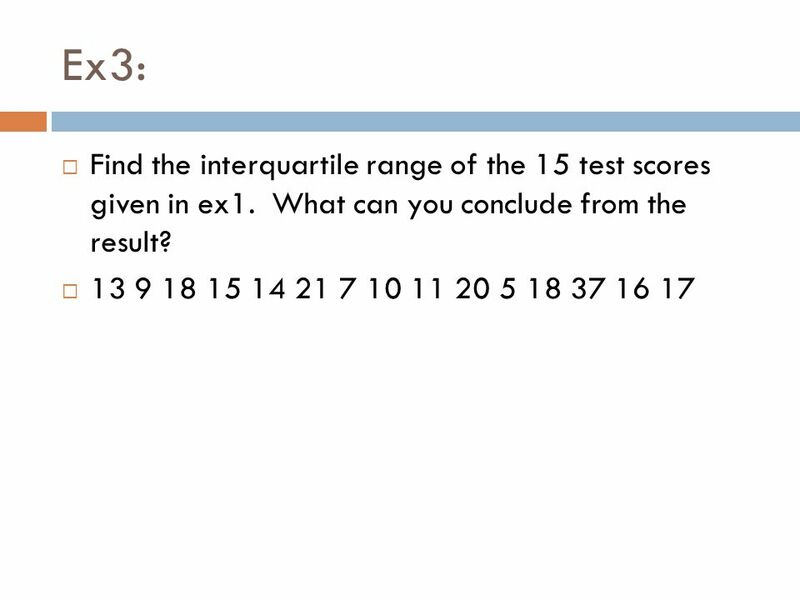 6 Ex3: Find the interquartile range of the 15 test scores given in ex1. What can you conclude from the result? 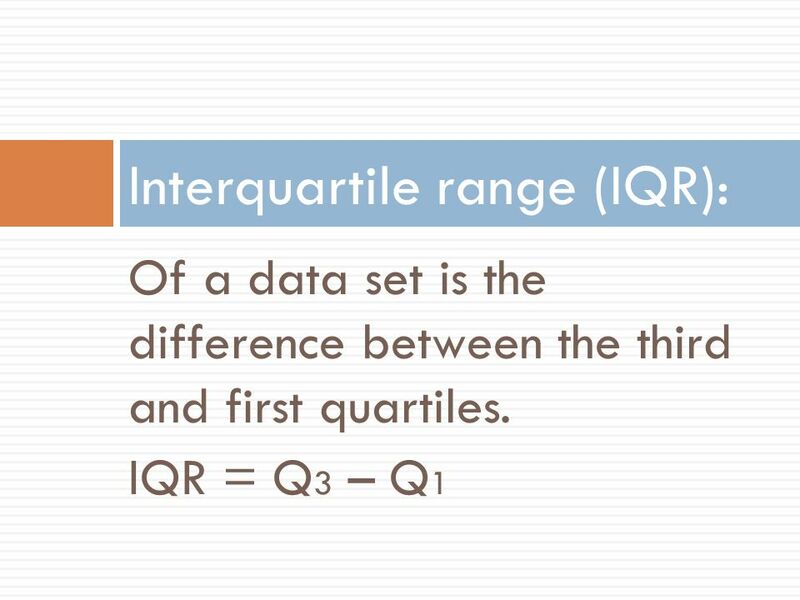 7 The IQR is a measure of variation that gives you an idea of how much the middle 50% of the data varies. It can also be used to identify outliers. Any data value that lies more than 1.5 IQRs to the left of Q1 or the right of Q3 is an outlier. 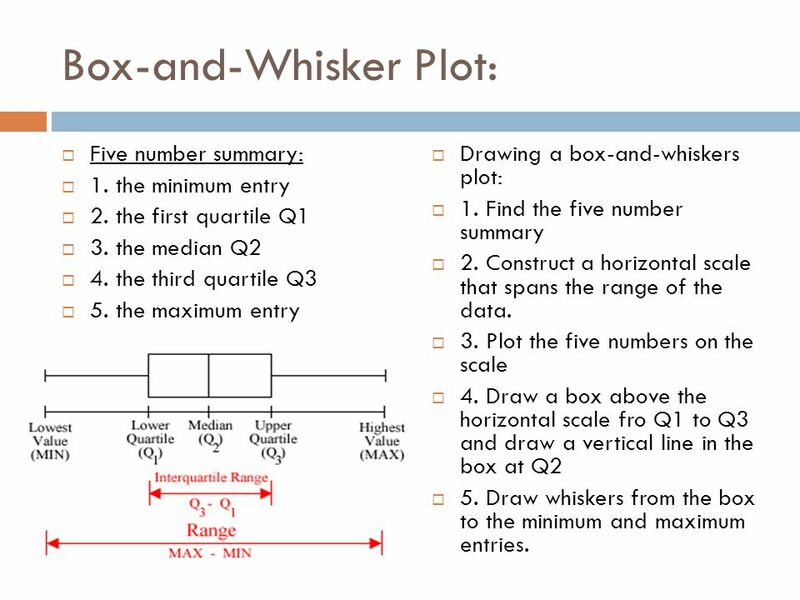 You can use a box and whisker plot to determine the shape of a distribution. 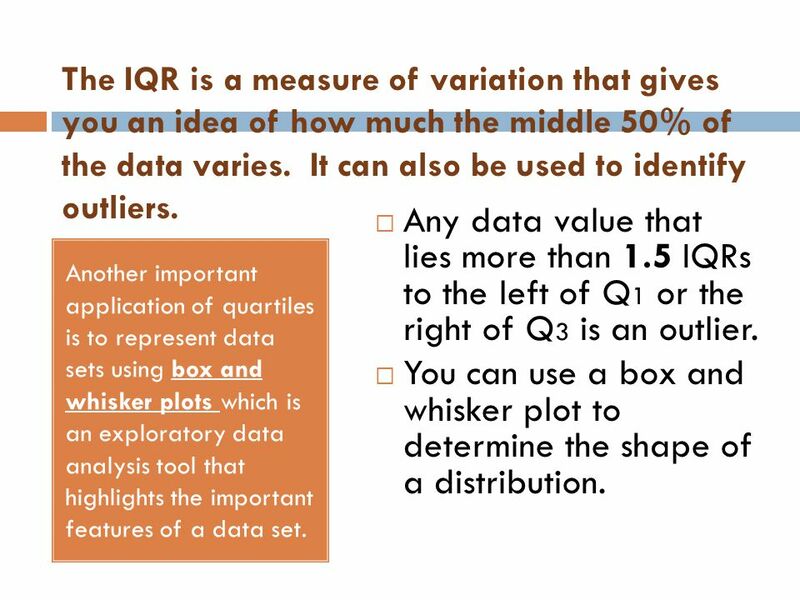 Another important application of quartiles is to represent data sets using box and whisker plots which is an exploratory data analysis tool that highlights the important features of a data set. Five number summary: 1. the minimum entry 2. the first quartile Q1 3. the median Q2 4. the third quartile Q3 5. the maximum entry Drawing a box-and-whiskers plot: 1. Find the five number summary 2. Construct a horizontal scale that spans the range of the data. 3. Plot the five numbers on the scale 4. Draw a box above the horizontal scale fro Q1 to Q3 and draw a vertical line in the box at Q2 5. Draw whiskers from the box to the minimum and maximum entries. 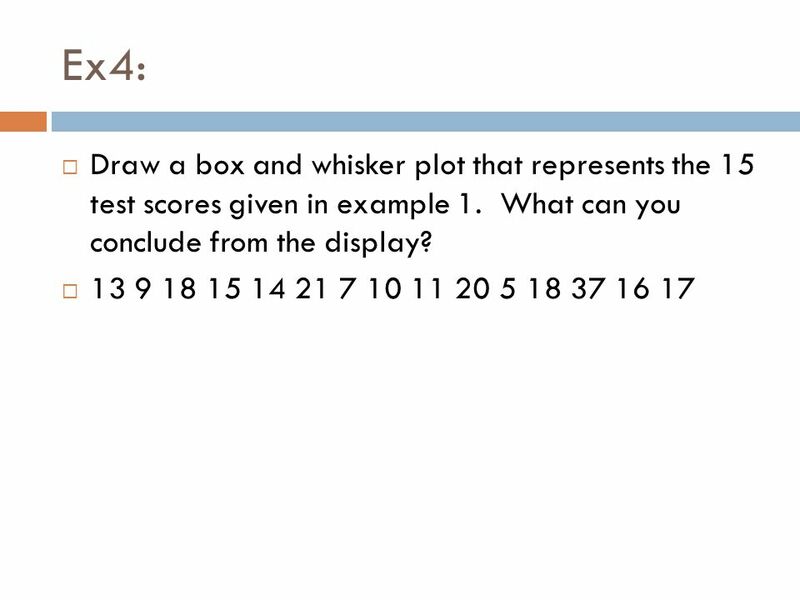 9 Ex4: Draw a box and whisker plot that represents the 15 test scores given in example 1. What can you conclude from the display? 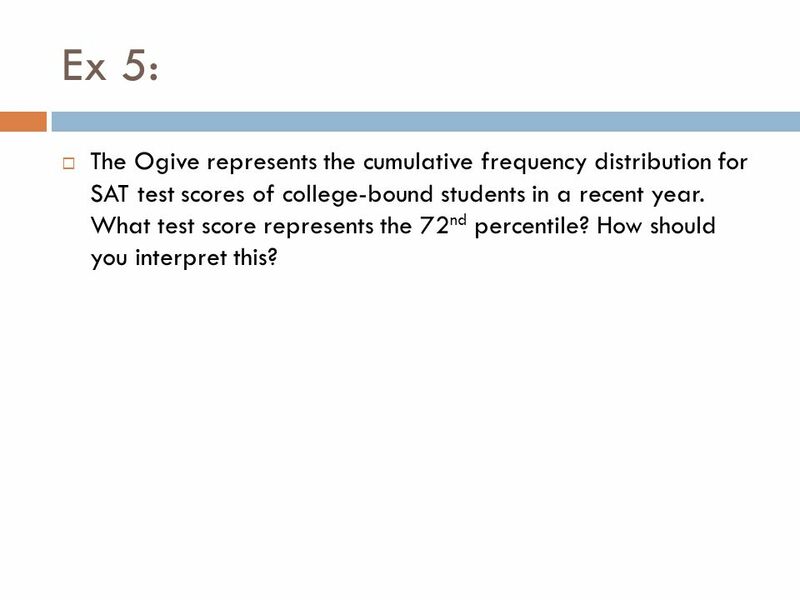 12 Ex 5: The Ogive represents the cumulative frequency distribution for SAT test scores of college-bound students in a recent year. 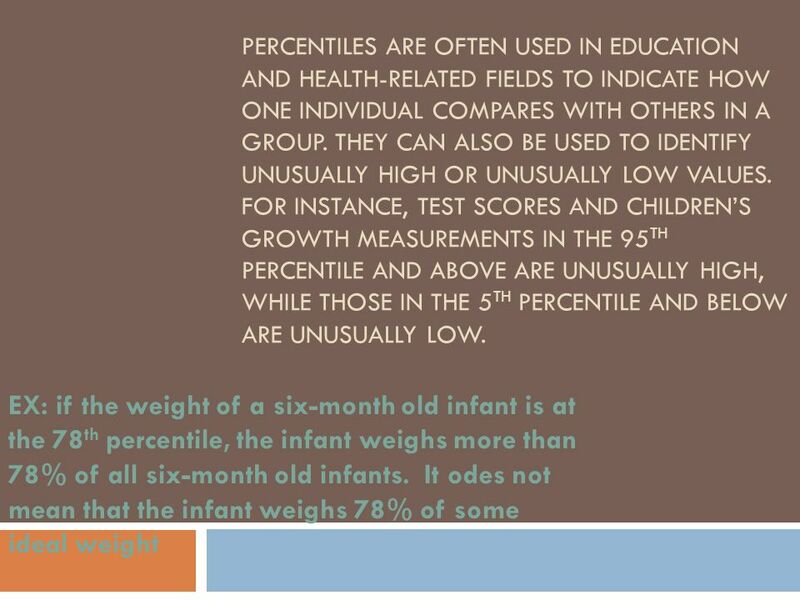 What test score represents the 72nd percentile? How should you interpret this? Represents the number of standard deviations a given value x falls from the mean, . 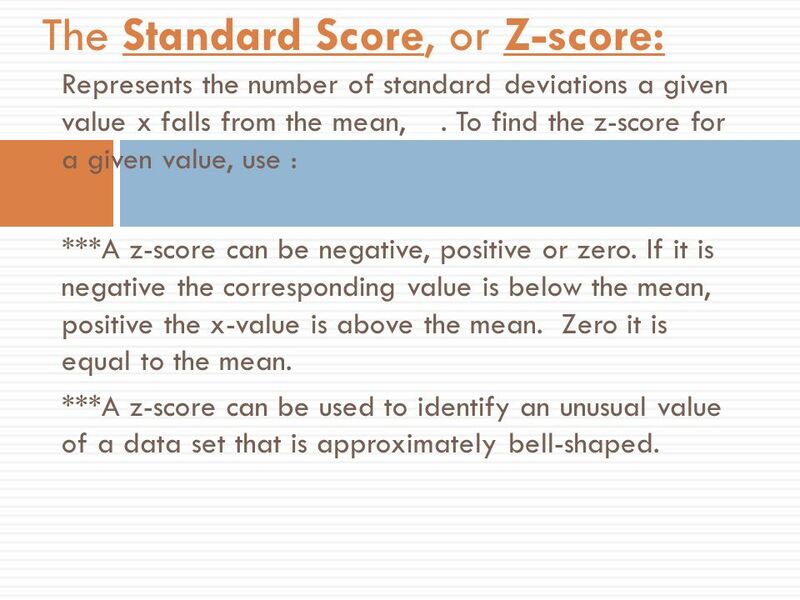 To find the z-score for a given value, use : ***A z-score can be negative, positive or zero. If it is negative the corresponding value is below the mean, positive the x-value is above the mean. Zero it is equal to the mean. ***A z-score can be used to identify an unusual value of a data set that is approximately bell-shaped. 14 Ex 6: The mean speed of vehicles along a stretch of highway is 56 miles per hour with a standard deviation of 4 miles per hour. You measure the speed of three cars traveling along this stretch of highway as 62 miles per hour, 47 miles per hour, and 56 miles per hour. 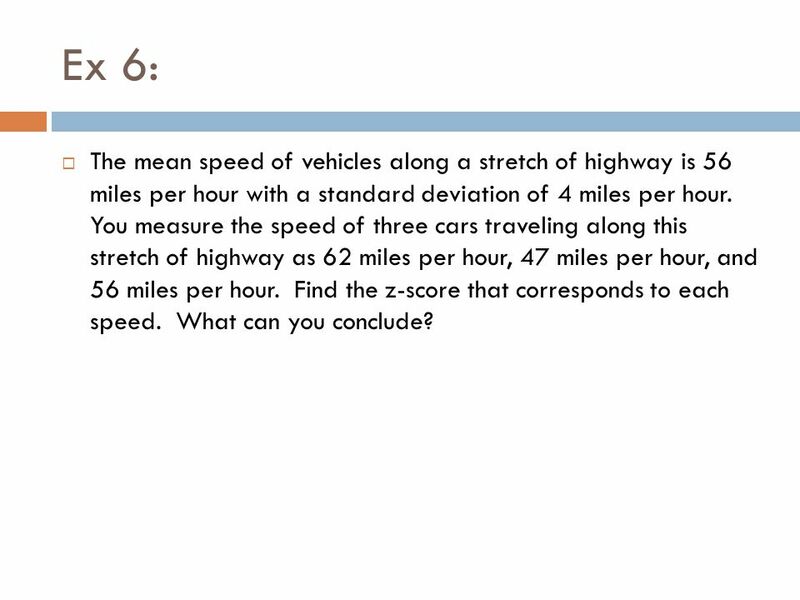 Find the z-score that corresponds to each speed. What can you conclude? 15 Ex 7 : In 2007, Forest Whitaker won the Best Actor Oscar at age 45 for his role in the movie The Last King of Scotland. Helen Mirren won the Best Actress Oscar at age 61 for her role in The Queen. 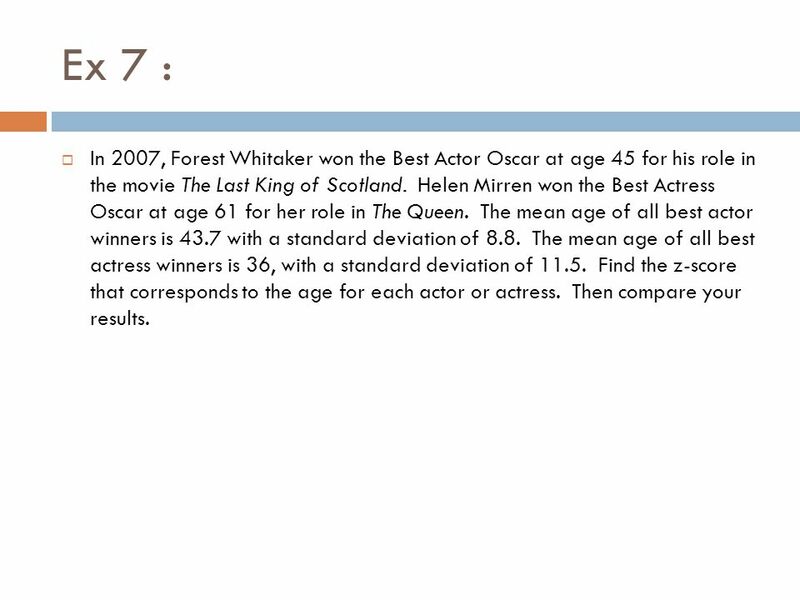 The mean age of all best actor winners is 43.7 with a standard deviation of The mean age of all best actress winners is 36, with a standard deviation of Find the z-score that corresponds to the age for each actor or actress. Then compare your results. 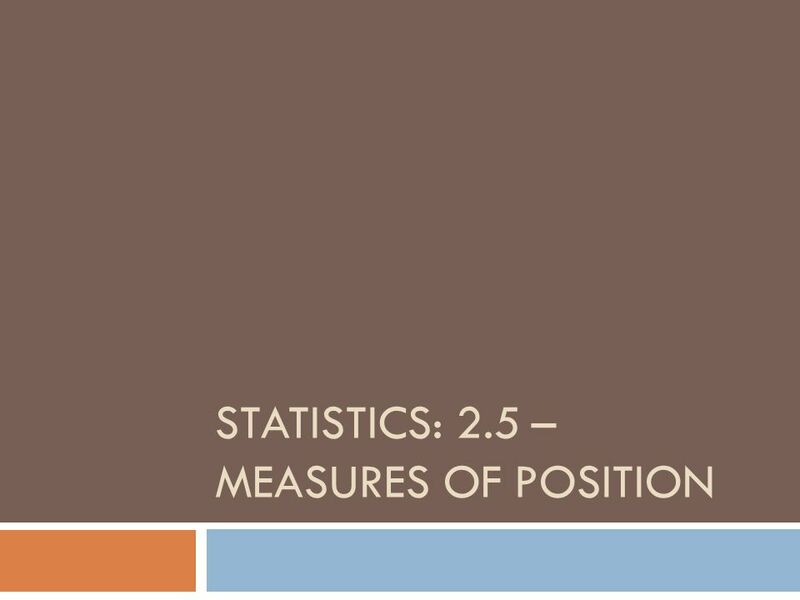 Download ppt "Statistics: 2.5 – Measures of Position"
Basics of z Scores, Percentiles, Quartiles, and Boxplots 3-4 Measures of Relative Standing. Section 2.5 Measures of Position. Statistics: Use Graphs to Show Data Box Plots. Box and Whisker Plots and Quartiles Sixth Grade. Five Statistical Summary When describing a set of data we have seen that we can use measures such as. Section 2.5 Measures of Position Larson/Farber 4th ed. Quartiles + Box and Whisker Plots. Quartiles Step 1: Find the Median. This is called Q2, or the second quartile. Step 2: Split the first half into 2 equal. 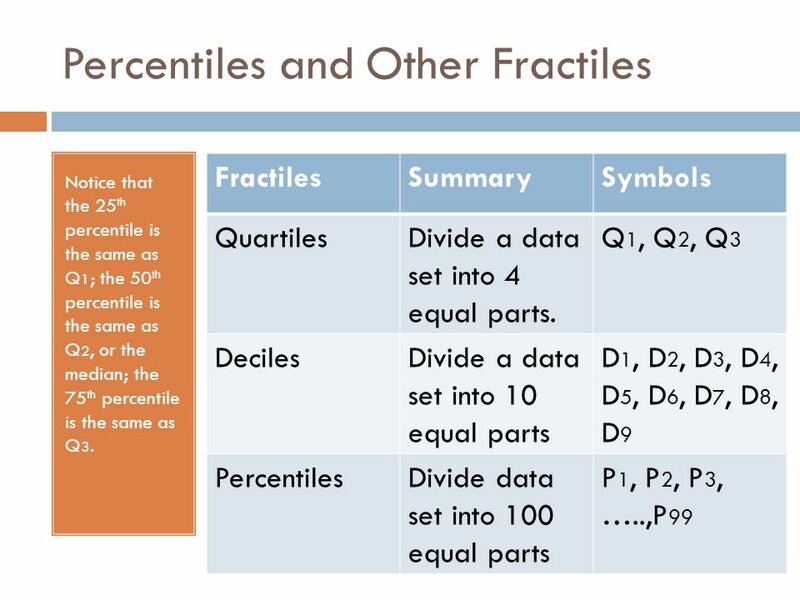 Chapter 2 Descriptive Statistics 1 Larson/Farber 4th ed.